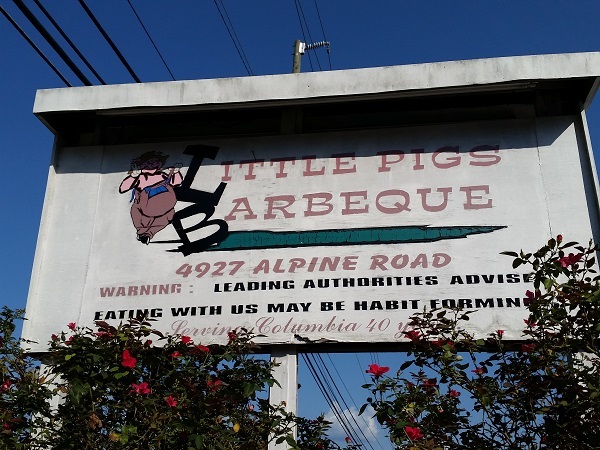 Little Pigs Barbeque, Columbia SC – Marie, Let's Eat! Of the five states that we have visited the most over the last six years, South Carolina’s barbecue has been the most uneven. To be sure, we’ve had some transcendent and amazing meals in the Palmetto State, and found some plates worth a very long drive, but we’ve also hit far more disappointments here than anywhere else. I’m very happy that Little Pigs, which is just northeast of Columbia, on the other side of I-77 and on the outskirts of Fort Jackson, is firmly in the “amazing” camp. I was hoping for a pretty good meal, and I got one of the best plates of barbecue I’ve ever had in this, or any state. Little Pigs traces its history back to 1961. “Little Pigs of America” was a franchise fast food operation that was based in Memphis and had outlets all around the southeast. It expanded far too quickly in far too short a time. The Columbia store’s website says that theirs was the 31st location, and that’s in just over a year. Within six years, the chain had failed, leaving what may have been more than 200 stores adrift. (Robert Moss reported on the chain’s short history in a 2012 story at CNN’s Eatocracy (link down). Moss claims 1967 as the end of the chain; this restaurant’s site says 1965.) What usually happens when a chain fails like that is most of the stores go with it, but some franchisees roll up their sleeves as newly independent restaurants and make a run on their own. Today, Columbia’s store is one of just a handful of independent survivors, and it has been at its present location on Alpine Road since 1978. Another Little Pigs is in Asheville and has been waiting patiently for us to quit horsing around and pay them a visit. Amazingly, that appears to be the oldest restaurant in that city still doing business today. I am not certain how the Asheville Little Pigs has evolved in the last fifty years, but the Columbia Little Pigs has become a buffet place like many in South Carolina. Some buffet places, like the really good Shuler’s outside Latta SC, will let guests dine in with an order from the menu rather than all-you-can-eat. Others, like the wildly popular Shealy’s, ask guests to get a sandwich to go if that is all that they want. That’s the case here, but I spoke with the owner, Champ McGee, who very kindly agreed to let my daughter and I take a seat and enjoy my sandwich and my side of hash and rice there instead of in the car. Don’t plan on that, though, folks. Not just because Champ graciously bent the rules for me, but also because I glanced at people’s plates as they came back from that buffet and I saw so many things that looked amazingly good. I tend to eat small portions on trips like these, and often don’t finish everything I order, and so I will be back here for a long and happy visit the next time the road brings me to Columbia. I’m noticing a trend that the better the food, the more difficulty I have getting a decently-focused picture of it. Ah well, luck’s just mean. And Samsung’s just awful. Anyway, Little Pigs offers three pre-sauced varieties of their pork, which is a mix of hams and shoulders. You can get it simmered in a tomato-based sauce or in a vinegar-pepper sauce, but definitely try the mustard-sauced pork. Champ explained that they marinate the meat overnight in the sauce in between two separate visits to the smoker, and that they use exclusively hickory wood. Mustard sauce, for those of us outside the Palmetto State, remains a divisive entity. My daughter just flat out will not touch the stuff. There are barbecue writers and hobbyists all over the southeast who raise a skeptical eye over it. More power to them, and I know where they’re coming from. Myself, I’ve enjoyed a few mustard sauces, and I’ve had lots of fun looking into the spread of Chicken Comer’s cayenne-laced hot lava mustard around west Georgia, but since I generally prefer – that’s generally, Marie, not especially, darn you – vinegar-based sauces and I prefer my meat dry rather than cooked-in-the-sauce, I’d never found one of these mustard marinades that really knocked me over. This did. I fell for this hard. This is outstanding barbecue. I want to come back here. Soon. I chatted a little with Champ and one of his guests after our meal, and thanked him again for bending the rules for me, and asked a little bit about his barbecue techniques, but didn’t think to mention how much I loved the hash. Especially coming after some very watery and disappointing hash earlier in the day, this was an extraordinarily pleasant surprise, and also among the best orders of this dish that I’ve ever had, if not number one outright. Last year Columbia Foodie News interviewed him, and he explained that the meat in the hash is a mix of ham and chuck roast only. I owe it to myself and also to you good readers to sample more barbecue in Columbia. 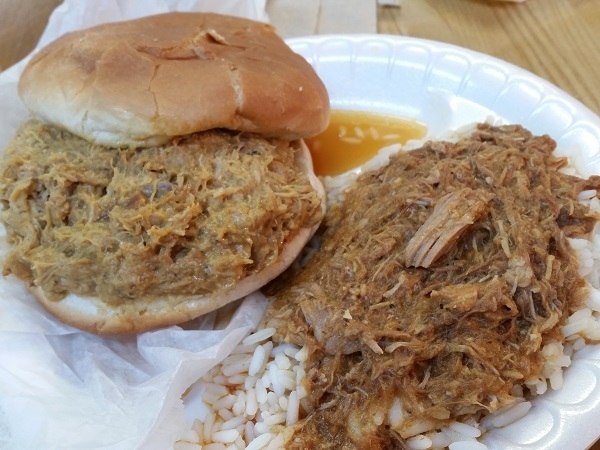 The awesome people at the USC Visitor’s Center were especially hopeful that I would try their consensus favorite, Palmetto Pig on Devine Street, and I would very much like to go back to True in West Columbia sometime. But this place… this place demands more of my time. Wow. Posted on September 20, 2015 August 23, 2017 by Grant G.Posted in barbecue, columbia, south carolinaTagged barbecue, columbia, hash and rice, mustard sauce, south carolina. I like mustard-based BBQ sauce well enough; for BBQ it can hide poorly cooked meat. It also shines as a condiment for other dishes: try it on a grilled cheeseburger, or as a substitute for ketchup on french fries. Grant, I couldn’t remember where I found the recommendation for Little Pigs. Lo and behold, here it is. Unfortunately, my experience was nothing like your report. It’s possible that it’s because I got there at about 7:15, and they close at 8:30. But I have to say, it was dreadful. By far the worst meal I’ve had on any of my trips. Almost all of food was cold, or barely lukewarm at best, including all the pork, the fried chicken, and every one of the sides I tried, collards, mac & cheese, hush puppies, etc. I took a tiny piece of brisket, which was cold and so tough, I couldn’t even chew off a bite. The entire experience was dreadful. Luckily, the day wasn’t a total loss, because it started at Grady’s (well, after Sunrise Biscuits). I know you didn’t have a great experience there on your one visit, but I think this was possibly the best of all the times I’ve been there. I had two pork sandwiches, and two pieces of fried chicken, and a side of incredible steamed cabbage. I hope you get a chance to try it again. Yikes! Sorry that you didn’t like it, but I sincerely hope that I can go back one day.